Kembrew McLeod’s new book, “The Downtown Pop Underground: New York City and the literary punks, renegade artists, DIY filmmakers, mad playwrights and rock ‘n’ roll glitter queens who revolutionized culture” is published by Abrams Press. 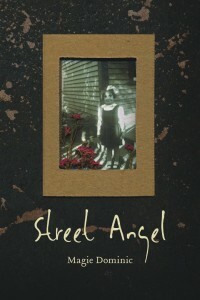 The author will read from it at Chop Suey Books in Carytown on Saturday, Oct. 27, at 7 p.m. He will be in Charlottesville on Friday, Oct. 26, at New Dominion Bookstore with Jocelyn Johnson at 7 p.m. 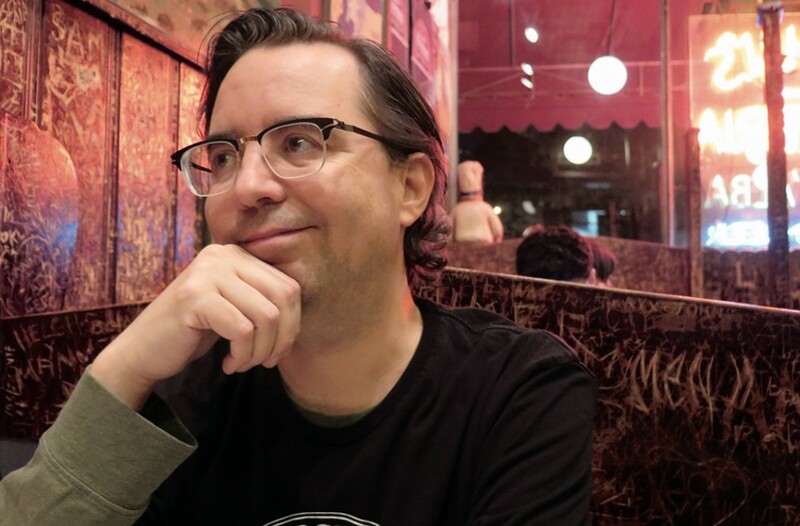 Author Kembrew McLeod, a Virginia Beach native, worked on his new book for more than a decade, and it all started in Richmond at a Lou Reed show in 1989. Today when longtime New Yorkers talk about how their city is a shadow of its former creative and artistic self, you can feel their pain. Everyone has been priced out, they say. Downtown has become a playground for the rich. You can learn more about how creative, experimental and interconnected things were in the New York of the ’60s and ’70s through Kembrew McLeod’s new book, “The Downtown Pop Underground: New York City and the literary punks, renegade artists, DIY filmmakers, mad playwrights and rock ‘n’ roll glitter queens who revolutionized culture.” (Abrams). A professor at University of Iowa, McLeod is also a documentary filmmaker, journalist and activist prankster originally from Virginia Beach, where he took high school theater classes with future actor Mark Ruffalo. He would earn his first degrees at James Madison University [where I met him] and the University of Virginia. 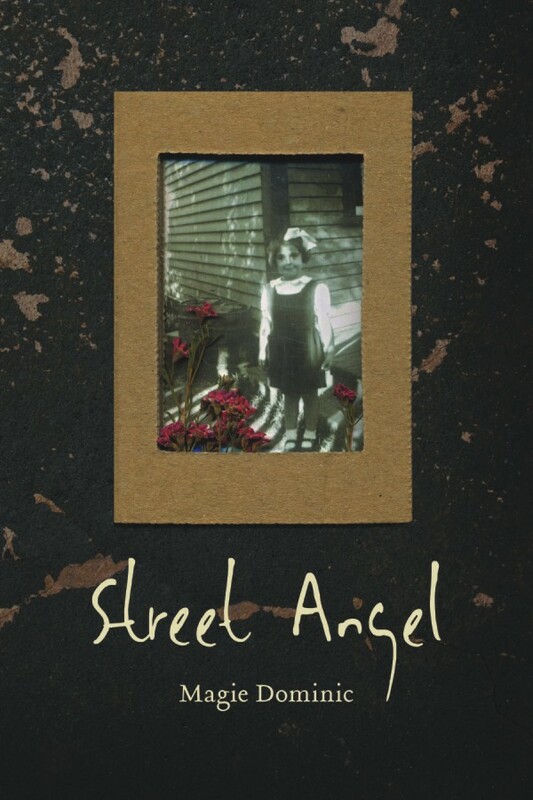 His latest book uses eight central characters to tell the story: filmmaker Shirley Clarke, playwright Harry Koutoukas, matriarch of La MaMa experimental theater, Ellen Stewart, performer Hibiscus of the Cockettes, poet Ed Sanders of the Fugs, artist Andy Warhol, and singers Debbie Harry and Patti Smith. The whole idea for the book started in Richmond in 1989, the author says, when as a youngish-looking 18-year-old he talked his way backstage at a Lou Reed, Maureen Tucker and Half-Japanese show — getting his Velvet Underground records signed, interviewing the notoriously cranky Reed (McLeod’s first interview) and scoring great, candid material. Style Weekly: How did you set about making your book different from the hundreds out there on this period? Kembrew McLeod: I think one of the things I knew might set this book apart is that I wanted to show how deeply interconnected all these different scenes were, how each one didn’t develop in isolation. They needed this outside creative energy coming from other art forms and mediums. The book is really making a prolonged argument that isn’t necessarily intuitive to many people: I’m arguing that underground theater, which came along 15 years before punk, created the template for what gets credited as punk innovation. 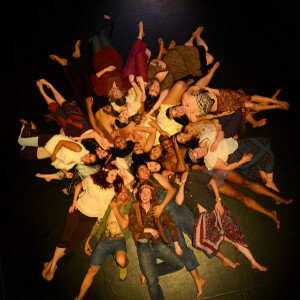 Breaking down barriers between audience and performer, doing-it-yourself, going around cultural gatekeepers, reusing public and private spaces to create a scene — all that happened with Off-Off-Broadway theater first. There are a lot of names and seminal moments — I’m sure that was a challenge to structure or make sense of all this info. Yeah, it was the biggest challenge. I spent years immersing myself in other books. Then over the past five years I did well over 100 interviews — over a million words of transcription. I thought about it like a movie like “The Godfather,” or a show like “The Sopranos.” Lots of characters and plot threads. So I picked the eight key people who represented border crossings of different scenes and art forms, and who were at the center of social networks that formed around downtown. Through them I could talk about pretty much anyone else — that provided the scaffolding. They took me into John Cage, Yoko Ono, Richard Hell, etc. I wanted to balance people who are very well known with people who have amazing stories but who weren’t household names … Chris Stein [of Blondie] was really helpful, those are mostly his photos on the cover of the book. Some parts remind me of the early ’90s scene in Harrisonburg and Northern Virginia with Riot Grrrl kicking off and Teen Beat bands Sexual Milkshake and Blast Off Country Style that we experienced — looking back, it all seems very Fluxus-influenced. Exactly. Yeah, that is a gift Virginia gave me. I saw a lot of ourselves in the lives of these people, although they had a much larger impact partly because of where they were, in this nexus of culture near Midtown [Manhattan]. Walter Cronkite was showing the Velvet Underground on TV in 1965 before their first album even came out. In your coda you mention newer music group Talibam! — how it tried to levitate the Vice Media building and dump it into the East River. Yeah [laughs]. I put that in there because of the parallels with the earlier story of the yippies levitating the Pentagon. The Talibam story encapsulates everything that has gone wrong in the past 20 years in New York. They are spiritual stepchildren of the Fugs and that’s a smart and funny moment of cultural criticism, using the Internet to get their story out. They targeted Vice because it had moved into a building previously used for underground rehearsal space and performance space for local artists. It was a perfect metaphor for what Vice does, which is cannibalize the culture of the underground and repackage it for various media platforms. It’s almost impossible for artists to survive downtown now in one of the highest income ZIP codes in the country. I wonder, with your history of pranks and friends of yours like the Yes Men, why are activist pranks not happening more in the age of Trump? That’s a hard question. A lot of us who do pranks are rethinking the efficacy of them. Basically those satires we were doing, most people would realize they were too absurd to be true. Today, we’re living in a time when [reality] seems like a prank. Also, a lot of our pranks were premised on basic ground rules of human rights — you don’t put children in cages, slavery is wrong. At the time there was some consensus about basic human rights that now is being called into question. Maybe that’s why younger people aren’t gravitating toward these tactics: They’re growing up in a completely different world. Doesn’t mean that satire is dead. We’re just rethinking the strategy. Yeah, I need to write about that [laughs]. 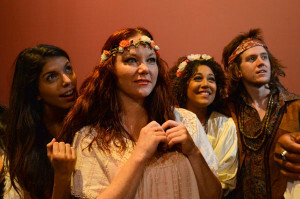 Bob’s plays include The Bed and Moon at the Caffe Cino; Why Tuesday Never Has a Blue Monday at La MaMa; Tropical Fever in Key West and Crisis of Identity at Theater for the New City to name a few. The Bed was filmed by Andy Warhol (his first split-screen), and Bob wrote Lupe for Warhol to direct with Edie Sedgwick. With his partner, author/actor John Gilman, Bob has written articles for periodicals including The Village Voice, WestView News, Oklahoma Today and many other publications. They are authors of many pop culture books, and books about New Jersey. 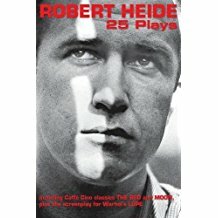 Robert Heide’s new book, Robert Heide 25 Plays, is available on Amazon.com, as is Flower Power Man. 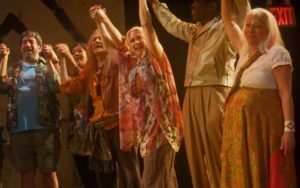 “Went to opening night for this glorious new production of HAIR at The Connelly Theater staring, among others, my dear friends Mary Lou Harris and Eloise Harris-Damone, sisters of my old friend Hibiscus (entertainer)! Went with Fussy Lo Mein, Fannie Mae B. Free, Hucklefaery Ken, Sasha Silverstein, Jamie Leo and Alan Sabal and what a treat to run into Jim Rado, co- writer of the original production of HAIR and theater luminaries Robert Heide and John Gilman from Cafe Cino days. 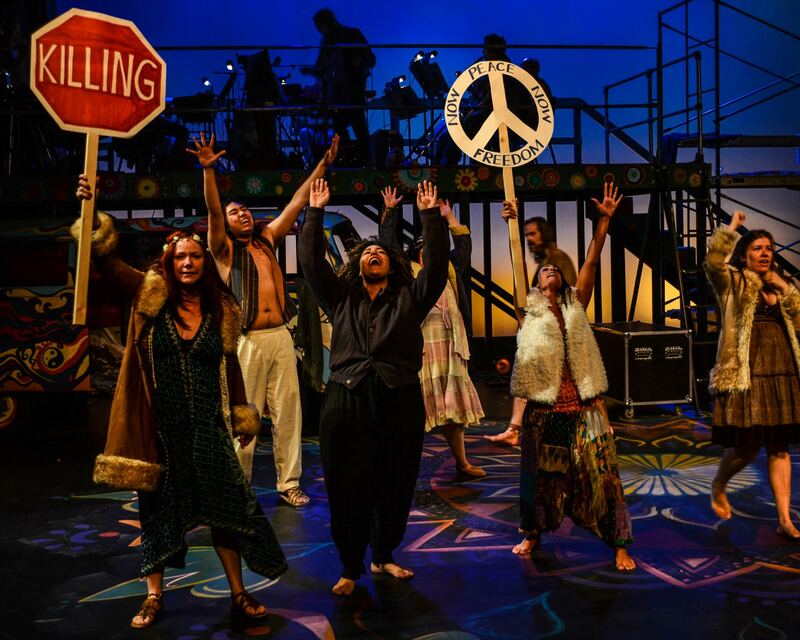 As we celebrate the 50th Anniversary of HAIR is was quite poignant to have a cast mostly made up of actors in their 50’s 60’s and 70’s, who were around for the original HAIR debut in 1967, beautifully giving it their all! The show put on by The Columbia University School of the Arts under the leadership of Anne Bogart is almost sold out but get a ticket if you can! Bravo to Mary Lou, Eloise and all! You certainly deserved the standing ovation! Photos above by Jackie Rudin. 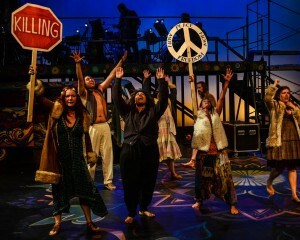 “Hair: A Tribal Love-Rock Musical” is connected very strongly to Cafe La MaMa. In April, 1966 Co-author Gerome Ragni was Clown 1 in an Open Theater production, “The Clown Play”, a scene by Bertolt Brecht. 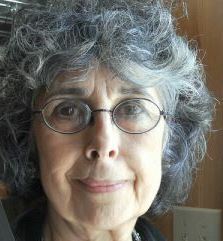 Clown 2, Joyce Aaron Funk, a year earlier joined Ragni and his “Hair” co-author James Rado in the Chicago production of Ann Jellicoe’s “The Knack” where the two authors worked on the “Hair” script. Joseph Papp was preparing the opening of his new Public Theater space when Gerome Ragni and James Rado brought him their play. Eventually Papp decided to use “Hair” as his inaugural production at the Anspacher Theater and Ellen Stewart invited him to use Cafe La MaMa on Second Avenue for production of the replaced play “Stock Up On Pepper Cause Turkey’s Going To War” (February, 1967) by Frank Zajac. Joseph Papp brought in his portable stage and he set it up on the floor of Cafe La MaMa. I think this was the first production at Cafe La MaMa without the service counter. The traveling stage took up too much space. 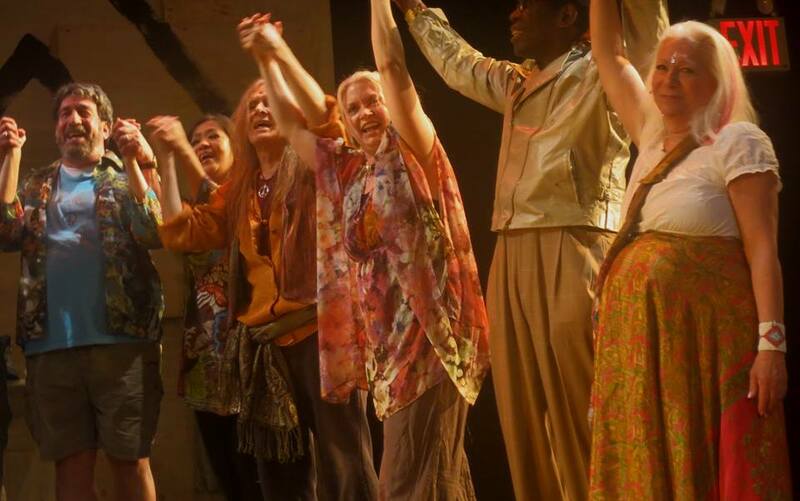 “Hair” anniversary celebrations have occurred at La MaMa Experimental Theater including the fiftieth only a couple months ago. 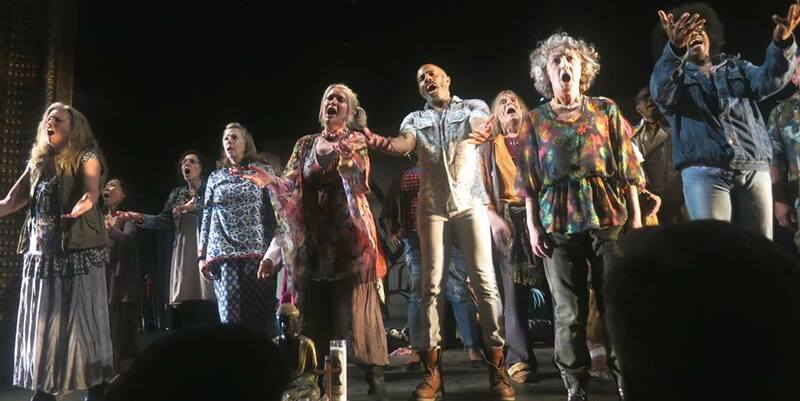 With Tom O’Horgan directing, the original Broadway cast included La MaMa people Walter Michael Harris, Jonathan Kramer, Marjorie LiPari with Seth Allen as a standby for Claude (James Rado’s character). Later, Tom Eyen cast Leata Galloway, an original cast member as Nefertiti in his 1973 production at La MaMa Experimental Theater Club on East Fourth Street. 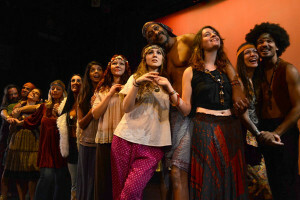 Curated and directed by Coffeehouse Chronicles Series Director Michal Gamily, LaMaMa is celebrating the 50th Anniversary of HAIR: The American Tribal Love Rock Musical with co-creator James Rado, composer Galt MacDermot, and featuring members of the original Off-Broadway cast of 1967, Broadway cast of 1968, and the cast of the 2009 Broadway revival, including Shaleah Adkisson, Debbie Andrews, Michael Butler (via video), Peppy Castro, André De Shields, Lauren Elder, Ellen Foley, Annie Golden, Walter Michael Harris (via video), Ula Hedwig, Antwayn Hopper, Rev. Marjorie Lipari, Melba Moore, Natalie Mosco, Allan Nicholls, Jill O’Hara, Jim Rado, Robert Rubinsky, Dale Soules, and Jared Weiss. The artist lineup is subject to availability and may change. The musical director and pianist Balint Varga will lead Richard Cohen as Musical Supervisor/Saxophone/Flute/Clarinet, Aaron Drescher on drums, Dave D’Aranjo on bass, and Thayer Naples on Guitar. 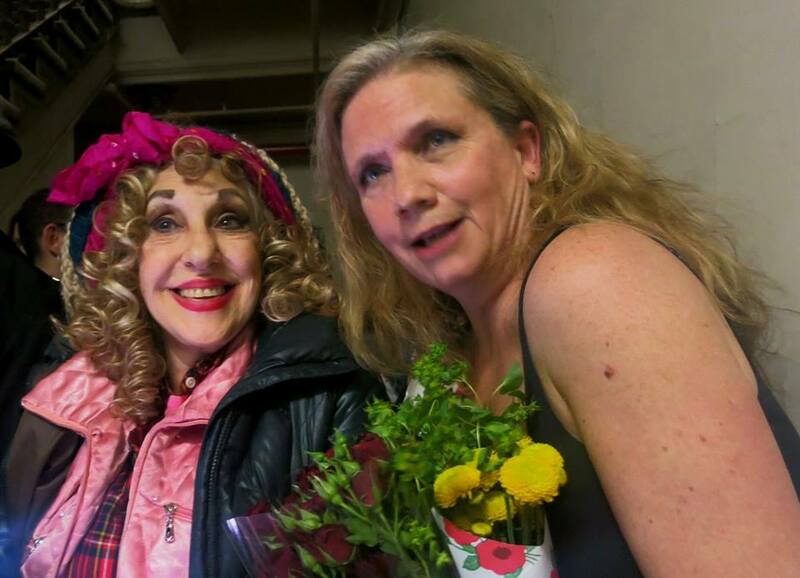 The Coffeehouse Chronicles #139, at La MaMa (66 E. 4 St. in NYC) on Saturday, January 21 at 2 p.m, moderated by Gamily and Coffeehouse Chronicles Co-Founder, Chris Kapp, will offer a panel, performances, and archival media by Dagmar Krajnc and the HAIR private collection. The event will also feature artwork by Suki Weston. 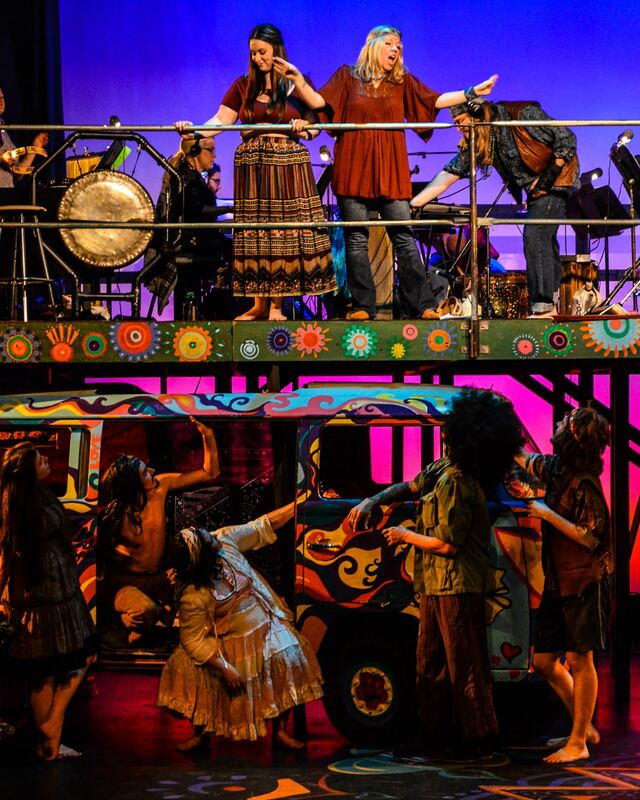 Click here for more information on Coffee House Chronicles and here for the 50th Anniversary of HAIR. 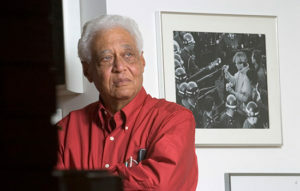 Ronnie Dyson and Walter Michael Harris sang the duet “What A Piece of Work Is Man” in the original Broadway cast. 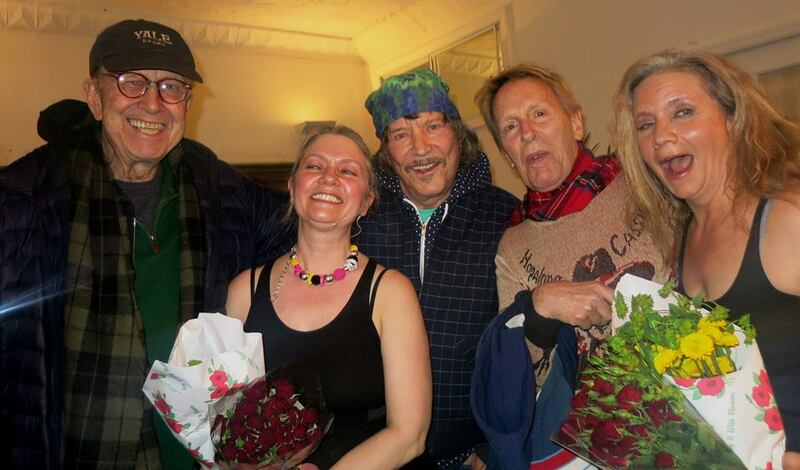 Photo by Dagmar. 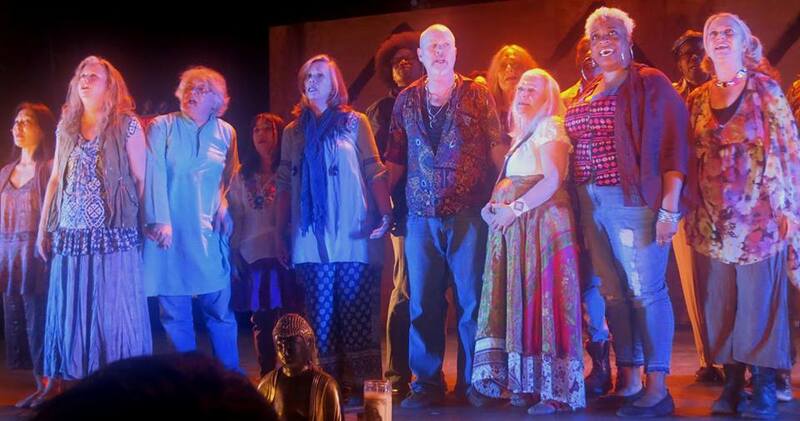 Mark Thompson helped the world understand the LGBT community. His influence is enormous, and his voice will continue to resonate through his publications, photos and in those he has influenced. 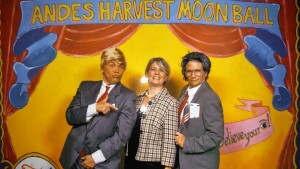 Harris Sisters win “Best Group” at Andes Harvest Moon Costume Ball! Each year the family tries to top itself at this popular Halloween costume contest in the Catskill Mountain town of Andes, New York. This year was no exception. 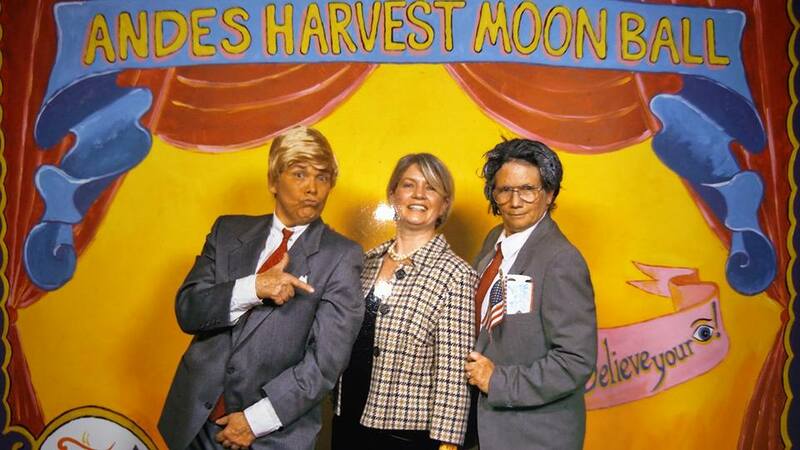 Here are your “Best Group” winners, The Presidential Candidates, from left to right: Donald Trump (Jayne Anne), Hillary Clinton (Mary Lou) and Jeb Bush (Eloise). Wow! If you live near Seattle, this is a HAIR you should see. Its anti-war message is as relevant today as it was almost 50 years ago. But don’t procrastinate – its three-week run ends Sunday, October 25. Below are director Teresa Thurman’s excellent program notes, and photos shared with me by BPA’s public relations director, Sally Jo Martine. What happens when two opposing forces collide, such as when a writer of college musical revues (James Rado) meets an experimental ritualistic theatre artist of the Open Theatre (Gerome Ragni) in the middle of an era of radical social change (1960’s)? 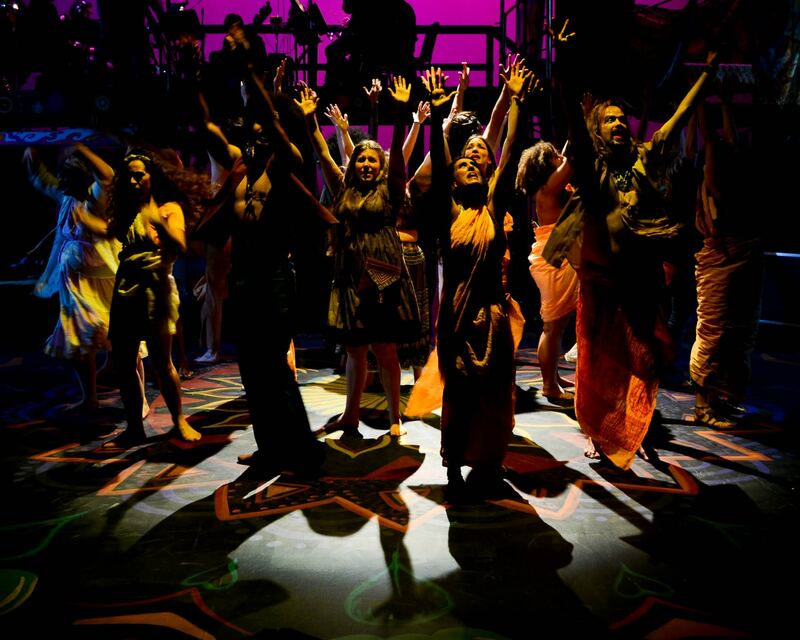 You get the cosmic explosion and unique cultural fusion that is HAIR, the Broadway hit musical. HAIR was honest, raw, organic, iconoclastic, non-linear, and spoke to a generation rejecting their parents’ rigid and conventional social norms. 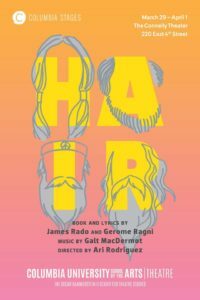 HAIR is primarily an anti-war story, created at a time of unapologetic experimentation with every conceivable means of altering reality: psychedelic drugs, sexual freedom, revolutionary politics, a search for identity, self-examination, and, under the shadow of potential induction into the draft, questioning existence itself. Within this environment, a brave, intimate and idealistic tribe is forged, and tested, on their path to celebrate the gift of life. HAIR is now almost 50 years old, and in 2015 our concepts of radicalism have changed. 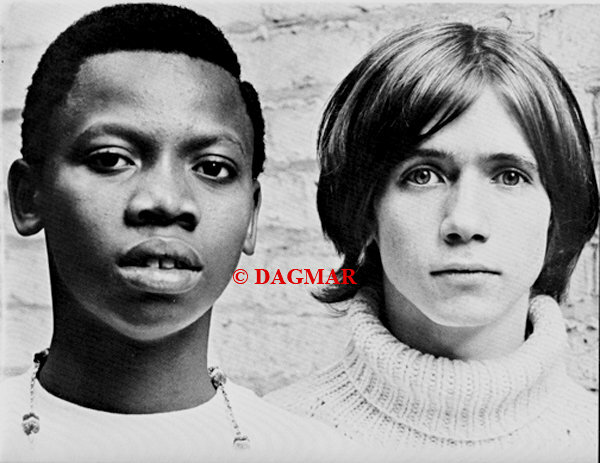 The pendulum of social change swings through the decades, and HAIR now holds outdated views of racial equity, cultural and gender identity, sexual orientation, politics and drugs (addiction is never explored). We look back knowing much of this hippie utopia was naïve and unsustainable. 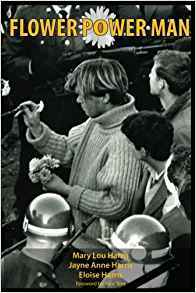 However, I am forever grateful to this vanguard of courageous idealists, because without their radical acts in the 1960s, this world would be a very different place. 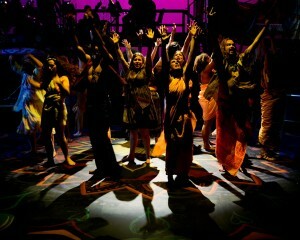 Perhaps the Age of Aquarius is indeed upon us and the endurance of this musical is proof enough for me.